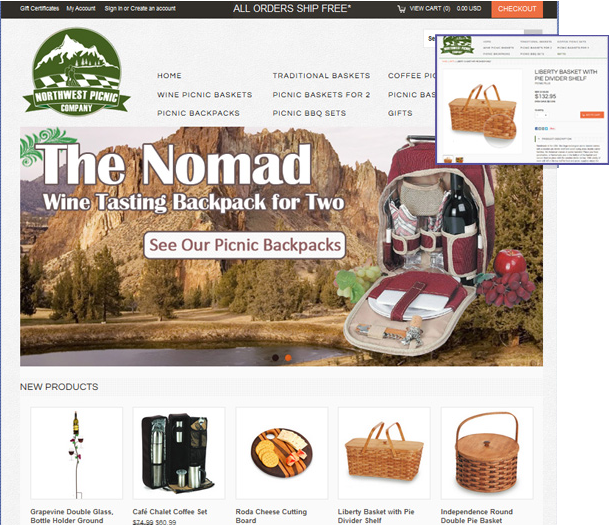 Northwest Picnic is a Protocol Three owned online store providing picnic baskets, outdoor dining supplies and gifts. Northwest Picnic is by outdoor lovers, for outdoor lovers. Based in the Pacific Northwest, this new company opened for business in early 2014 just in time to advertise for the Spring season and provide picnic baskets, backpacks, and outdoor dining supplies for hikers, campers and people who just generally love being outdoors. This is a “Poster Child” site that is owned and operated by Protocol Three. We built this store with our love of the Pacific Northwest in mind on our favorite online storefront platform, BigCommerce, and we’re pleased to add it to our portfolio to demonstrate just how great the BigCommerce platform is. In addition to the development of this unique online brand, we’ve also cooked our own marketing strategy that includes SEO, Google Adwords / Product Listings, a monthly newsletter, branded Youtube videos, and designed our own social media strategy that is well underway.